Selecting the right dicing blade parameters, often involves a trial and error process. Many which can be avoided through experience and understanding of how to use these parameter for your specific application. What works for one application, may not work for another. While there is no real substitute for experience, even new dicing saw operators can quickly become proficient by learning and applying some basic principles of dicing. Many parts of this guide have been published or presented in several industry magazines or presented at conventions. Dressing is the process of sharpening diamond particles in diamond bond matrix in order for the diamond particles to freely penetrate into the material, minimize loads, and provide good cut quality. Another reason for dressing blades is to clean a loaded blade from debris that is filling the pores between the abrasive particles. Cutting into the dressing plate creates mechanical and thermal stress and thus produces clean surface. It is important for the diamonds to be well protruded and exposed in order to easily penetrate into the material being cut. 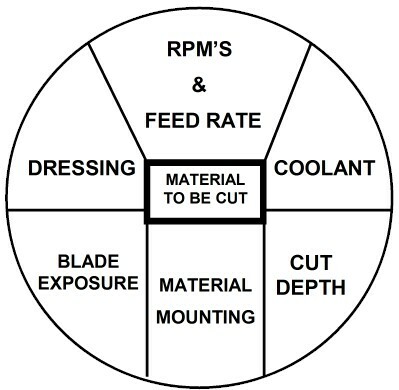 Dicing blades that are poorly dressing will tend to push the material, creating high loads, high cutting temperature/heat and poor cut quality. This can also cause blade breakage. Resin bond dicing blades have a soft binder and in most cases will require minimum dressing, if any at all. Resin bond dicing blade are typically dressed in the material being cut. This is why they are frequently called “self dressing blades”. Nickel bond and metal bond blades have much harder binder and much more aggressive dressing is needed in order to achieve the above mentioned goals. Nickel bond dicing blades require dressing. Hubbed nickel bond dicing blades are partly pre-dressed when they are manufactured. And typically do not require any dressing. Dressing will remove nickel built up or diamond protruding from the blade surface are sheared off. Since nickel bond dicing blades are typically used on silicon. It is recommended to conduct the dressing cycle also in silicon. Dressing programs usually involve various steps of table speeds, starting slow and increasing until production speed is about to be reached. Great care has to be taken that the dressing depth is deeper than the required production cutting depth. This will insure that only dressed blade sections are used for production cutting. Dressing procedures are established by end user and based on experience and the application concerned. There is not one common method that applies to all applications. The application below is a good starting point. When cutting silicon most nickel bond hubbed dicing blades do not require dressing. However on gallium wafers, dressing will be beneficial and increase blade life and improve cut quality. It is specially recommended to dress blades used on gallium and III-V wafers. Sometimes a blade that requires dressing is mistaken for a defective blade (blade that cannot be used). This is not necessarily the case. The most frequent cause of this affect is a diamond particle or few diamond particles excessively protrudes from the nickel bond matrix, causing excessive chipping. By dressing the blade, this problem will be eliminated. Coolant supply position and pressure is critical to minimize chipping, and maintain consistent and acceptable cut quality. The amount of coolant and its supply is of little importance when cutting silicon with nickel bonded dicing. Most dicing saw operators used deinonized water for this application. If the wafers are sensitive to electrostatic charges, the required conductivity is set using CO2. For this application single nozzle may be sufficient. However when cutting ultra hard & brittle materials the coolant flow direction and position will play a major role in determining blade life and performance. When cutting silicon the direction of cutting is not of ultimate importance. Often most wafers are cut by moving the table back and forth. However, when cutting hard and brittle materials this quiet different. The blade should enter into the material “cutting down”. As the blade penetrates the surface of the material, chips removed by diamond particles become smaller the deeper the blade penetrates. This cutting direction is most optimal to provide best cut quality. When cutting in the opposite direction the blade enters the substrate almost tangential. The chips removed are being small and start but their size increases to maximize where the blade exits the face of the substrate. Much chipping at the surface is the result. Cutting in the up direction creates more edge chipping than cutting down. The spindle torque is noticed to be the large cutting up than when cutting down. Dicing thicker material over .100” 925.4mm) presents additional challenges to dicing blade and supplying sufficient coolant directly to bottom of cutting zone. Some possible solutions to resolve this include specially formulated water soluble based dicing coolant. Doing so would lower the surface tension of the water and help coolant better penetrate the full depth of kef. Furthermore the coolant would act as a lubricant and aid in minimizing the load created by dicing process. Another solution would involve use of specialized flange set. Coolant temperature will also have an affect on blade life and cut quality. Typically coolant temperatures of 50 degrees F (10 degrees Celsius) will provide best results. White coolant temperatures above 80 degrees F (27 C) should be avoided. Refrigeration of the coolant system can be used with most coolant systems and will provide best results. Coolant is one of the most overlooked variables in the overall dicing process. Effective and proper use of coolant and recalculating coolant system will pay off in terms of improved surface finish quality, increased blade life and more consistent cutting results. Coolant does more than just cool the blade and material, it other more important roles include: lubrication, flush away swarf particles. For most affective use of coolant the quality of water being used, coolant concentration, and maintenance of the coolant tank makes a difference. Different geographic areas have different water harnesses. Water containing less than six grains of dissolved minerals per gallon is considered soft water, water containing more then seventeen grains per gallon is considered hard. The best coolant water to use in a coolant system is chemically pure water, which is free of all dissolved solids. Chemically pure water and reverse osmosis. Reverse osmosis is the method most recommended by coolant manufacturers, however not always available. Deionized water offers much improvement over available plant water. Water in the tank can evaporate and remaining water can become harder. Hard water affects coolant capabilities in many ways decreased capability to the rust inhibitor, increased foaming, formation of a sticky residue, and increased bacteria counts. Coolant concentration should be controlled and maintained to ensure that the coolant is being used at optimum efficiency. Too little coolant in the tank will lead to corrosion and rancidity, while too high of a concentration can also cause foaming. Maintenance of the re-circulating tank is also critical to coolant performance. Cleaning he tank is a dirty job, but if done often enough and thoroughly, it can increase the performance of your dicing saw. Keeping he coolant tank clean will ensure that you are getting the most form your coolant, keeping corrosion and bacterial growth a bay while providing the necessary coolant, lubrication and protection of your blades and material. Mounting material is the first step in dicing process. Its very important to use the right mounting media for your specific application/requirements. There is large variety of mounting methods available to best suit each dicing application. High volume dicing applications require use of UV tapes. Where on small applications, R & D applications, and application for dicing small die and ceramic s many bond one wafer to a selected dicing substrate by waxing. Selecting the right mounting methods will play a major role in optimizing your dicing application to ultimate level of efficiency. When material is to be diced/scribed partially (not all the way through). The mounting method to use is of little importance. However when cutting all the way through the material there will be many variable in play that need to be controlled in order to achieve best results. Your goal should be to have good and uniform contact between material and type. Without presence of any air bubbles, dust or dirt particles between material and mounting media. Tape is most common and frequently used mounting methods for majority of dicing applications. Tapes are preferred my majority of dicing applications, because of their ease of use, ease of handling, and fact that it can also be used later in die mounting process. Large variety of tapes are available today. Low strength, medium strength, and high strength tapes Mounting is done manually or utilizing wafer mounting systems. Low strength adhesive tapes are not recommended for cutting small dies, as well as large production applications. For these applications most users use medium and high strength adhesive tapes. Determining which tape to use for your application, sometimes may involve some trial and error. For example the length of time the material or wafer will stay in contact with the mounting tape before and after dicing will determine whether to use medium or high strength tapes. Wafer/material thickness is another consideration when selecting the right mounting adhesive. Very thin dies work well with waxes and medium strength tapes. Whereas, thicker wafers work better with medium to high strength tapes. Cutting too deep into the mounting media will cause the blade to “load”. Minimize the depth in which the blade touches the mounting media. It is recommended to cut no more thane twenty five microns into the media. Cutting too deep into the media will cause premature blade failure. The blade can also agglomerate with the cutting media, resulting in chipping. No lip effect – capability to cut much deeper into the base material. This typically results in better cut quality, specially on back side of material. Different hardness base media can be used to control blade wear and simultaneously dress the blade. Common base media used is glass or ceramic. Wax mounting is typically used for mounting very thin and brittle materials. There is a large variety of waxes that can be used for this purpose. These are typically available in lumps, molded bricks, flakes, chips and powders. Wax provides best adhesion of material to supporting substrate. Allowing deep cutting into substrate. This frequently eliminates the lip effect and cracks at the bottom of material. Also wax expands as it fills in the gaps of a non flat substrate. Providing best adhesion of material/dies, equates in superior cut quality and consistency. Some disadvantages of wax mounting is that is a relatively messy process. Specially taking off the material and cleaning dies afterwards. Waxes have various characteristics that make the best suited for specific applications than others. This depends on their melting point, flash point, specific gravity, structure, hardness, brittleness, flexible and elastic characteristics. Mechanical clamping is typically used when geometry of material being mounted is unevenly shaped, that other mounting methods cannot be used. This method also offers number of advantages for more standardize/flat materials in ease of use, loading, and unloading. Some challenges of mechanical fixturing chipping at bottom of the cut. The problem is the back side of material does not have firm support at cutting area, therefore creating higher chipping rate. Proper blade mounting in a flange set in acceptable condition is key to any successful dicing operation. Any small scratch or nick in flange edge can cause improper blade mounting. This can lead to slanted cuts, blades wobbling and wider cuts, more chipping, or even possible blade breakage. When it comes to optimizing your dicing operation. Two most important variables spindle speed and feed rate will typically take presence over all others. Different material have different requirements for cutting speed. Material hardness, density, and spindle sped will affect both spindle speed and therefore cut quality. Low spindle RPM’s will cause the blade to wear faster to maintain better cut quality. Causing softer dicing action, where each diamond particles grind out larger portion of material. Higher spindle RPM’s will do the opposite. Each diamond particle will grinds away a small portion of material, creating harder dicing action. Feed rate should be determined by your desired cut quality, material hardness, density, and thickness. Most dicing operations require cutting as much material as possible, in shortest period of time possible. Frequently most gains in cutting speed and output are done at the expensive of cut quality. You should maintain the feed rate best suited for your required cut quality. Too high feed rates can also cause excessive chipping and material cracking, increasing die rejection rates. Frequently high producing dicing operations are under the pressure to meet production quotas and reduce costs. Many dicing operators are tempted to increase feed rates to meet demanding production rates. The short gains in production, can be significantly offset by the costs and time of using extra material, redoing the dicing operation, and additional labor involved in redoing the job and rejecting out of spec parts. Cutting depth is typically determined by material thickness. Cut quality is affected not only by material thickness, but the mounting media as well.